Check Below - Ansi Blind Flanges Dimensions - Blind Flanges Weight - Blind Blank Flanges - Blind Spectacle Flanges - Blind Pipe Flanges - Blind Plate Flanges Suppliers Malaysia, Uae & Singapore. 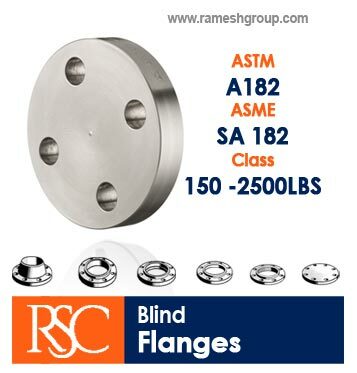 Ramesh Steel is India based company, a largely diversified Blind flanges manufacturer company in india, A majority of our business originates from the India, Ramesh Steel has the capability to manufacture Blind Flanges for all pressure ratings including 75#, 125#, 150#, 175#, 250#, 300#, 350#, 400#, 600#, 900#, 1500#, and 2500#.suppliers of blind flanges in singapore malaysia houston brisbane uae. Ramesh Steel Corporation offer blind plate flanges manufactured at our facility to companies in various industries including shipbuilding, petrochemical plants, power generation, oil refineries, waste water treatment plants, paper mills, pharmaceutical plants and turnkey projects among others. Ramesh Steel Corporation is a specialised manufacturers of high quality ASME/ANSI/DIN industrial blind flanges in India. Ramesh Steel Corporation offer immediate delivery programs for standard size of carbon steel blind flanges and stainless steel blind flanges. Plate blind flanges manufactured in special stainless steel grades, nickel alloy and alloy steel can be supplied with just in time programs. Our products are widely exported to countries and regions such as the United States, Europe, Russia, Turkey, houston,texas Malaysia, the UAE, Saudi Arabia, India, Brazil, Chile, Mexico, South Africa, Jordan, Tunisia, Vietnam, Indonesia, Thailand, Singapore, Colombia, and Sri Lanka. Our blind flanges are available with raised or RTJ faces and also with female threads. Blind flanges can be supplied with or without hub as per the customer requirements. Commonly referred as blanking flanges, Blind pipe flanges are widely used in high pressure applications. Blind flanges are generally used to seal the end of a piping system to prevent flow of liquids or gases. The use of blind flanges allows ease of access to a piping system once it has been closed. Production Range of Blind Flanges, BL Forged Flanges - Ramesh Group blind flanges suppliers in singapore malaysia houston brisbane uae, ansi awwa blind flanges pn6/pn16 dimensions, rtj din 2527, 150# blind flanges, 30 blind flanges, 4 inch blind flanges, 6 blind flanges. The charts show the blind flange dimensions and weights according to the EN 1092-1 type 05, the European specification for steel flanges. Our range of Blind Flanges and NPT flanges are manufactured as per international quality standards and is available in various dimensions. Our Blind Flanges are used with their main advantage being that they can be used for extraordinary circumstances and in highly volatile areas where welding is hazardous. Our NPT Blind Flanges can attached to the pipe without welding. These are low maintenance Blind Flanges made from high quality raw material, that are available at fair prices. We ensure timely delivery of the products within stipulated time frame. The wide range of ANSI B 150 Class- Blind Flanges offered by us is in conformation with international quality standards. These are designed as per the standards set by various national and international authorities and are manufactured using high grade steel. Our range of flanges is highly acknowledged in the domestic and global markets, due to features such as application specific design and corrosion resistance. Blind Flanges are widely used in special circumstances with their main advantage being that they can be attached to the pipe without welding. We are one of the leading manufacturer and supplier of steel threaded flanges in India, we can supply stainless steel, carbon steel and nickel alloy threaded flanges. We are a leading manufacturer and exporter of a wide range of ANSI B 16.5 Class 300 - Blind Flanges, which has dimensions that corresponds to the inside diameter of the pipe and has a standard wall thickness of 40S. The weights of these flanges are based as per the clients’ requirements. We have with us a range of ANSI B 16.5 Class 600 - Blind Flanges that are manufactured using high grade steel. These flanges are suitable to be used in low pressure services at ambient temperature. Designed using advanced technology, our range is widely appreciated for dimensional accuracy, corrosion resistance and high durability. Further, we also make sure that these flanges meet the international quality standards. Another range of threaded flanges offered by us is ANSI B 2500 Class- Blind Flanges. These conform to ASME B1. 20.1 NTP threads, the only exceptions are small male and female plain face threaded flanges which use NPSL locknut threads. The flanges offered by us are offered in numerous specifications and can be further customized as per the requirements of our clients. The ANSI B 300 Class Blind Flanges offered by us conforms to the ASME B1. 20.1 NTP threads. Designed as per the industry established parameters, these are fabricated using high grade raw material. These flanges are counter-bored and are chamfered to the counter bore at an angle of 450 (approx). Our range of threaded flanges finds application in numerous industries and is known for optimum performance and durability. Ramesh Steel Corporation is ISO 9001:2008 certified Manufacturer in India of blind flanges. Special price offer on blind blank flanges, rtj blind flanges, drilling blind flanges, ghost blind flanges, galvanized blind flanges, blind pipe flanges, blind plate flanges, blind flanges stainless steel, blind spectacle flanges Materials,Including Casting Pipe Fittings, Stainless Steel Pipe Fittings.